Page added in August 2018. Photos taken in April 2017. You may wish to see an introductory page to this section or to Tarragona first. 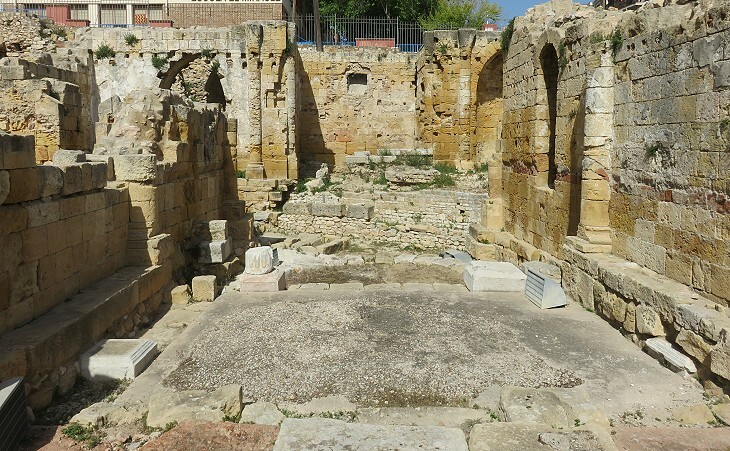 Bishop Fructuous and his deacons Augurius and Eulogius were executed in the year 259 in the amphitheatre. A church was built in the late VIth or VIIth century on the site of their martyrdom. It was a small building with an apse. In that same period the arena was turned into a burial ground. 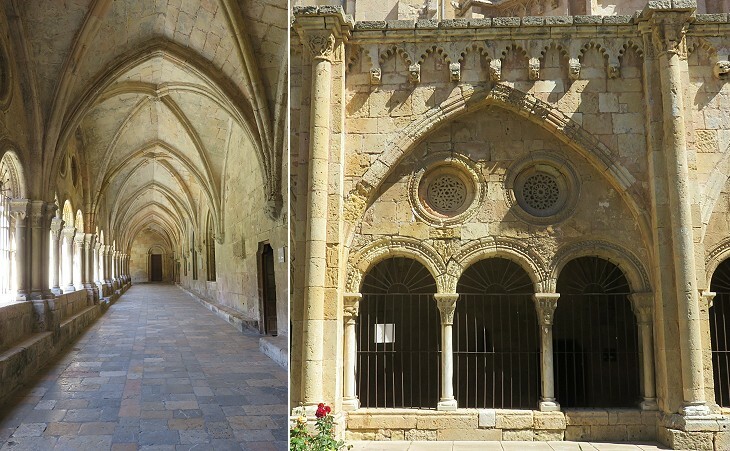 In the XIIth century a larger Romanesque church was built in the same location. Its nave incorporated the foundations of the earlier church. 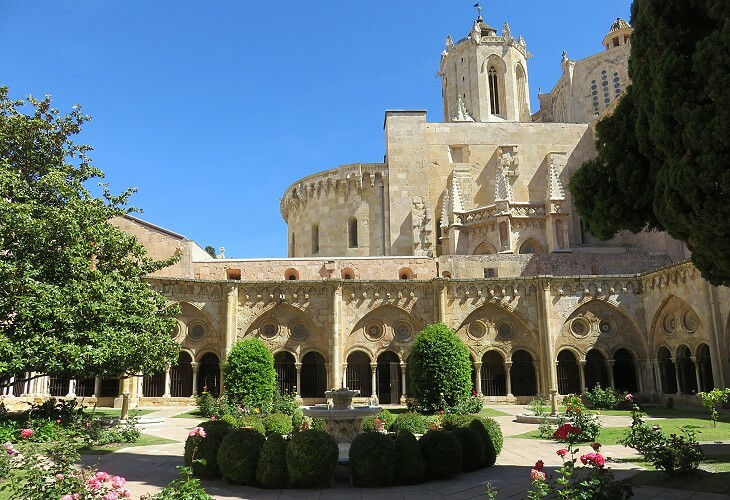 The existence of the two churches was discovered in 1953 and the walls of the Romanesque church were partially reconstructed. In 1923 evidence of a large necropolis was found during the construction of a tobacco factory at the western end of the town. It is dated IIIrd-Vth centuries because archaeologists found both Pagan and Christian tombs, although the latter were in greater number. 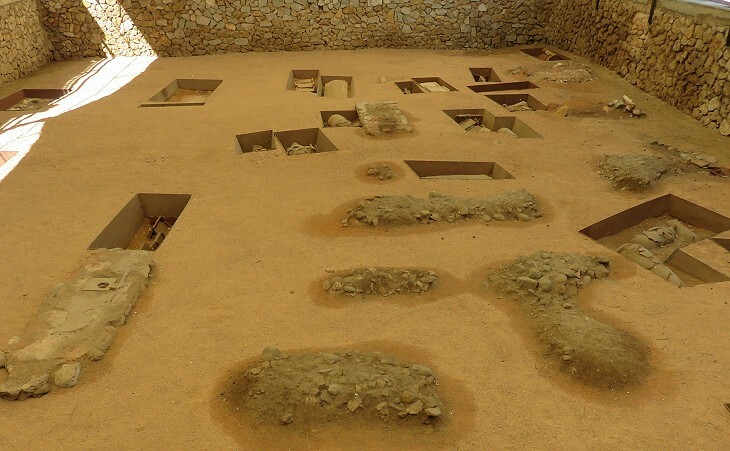 Most of the dead were placed in roughly cut sarcophagi or their burial site was marked by roof tiles. The way the burial sites were arranged does not seem to follow a plan and in most cases they appear to be for individuals rather than for a family. You may wish to see a Early Christian funerary basilica at Salona. 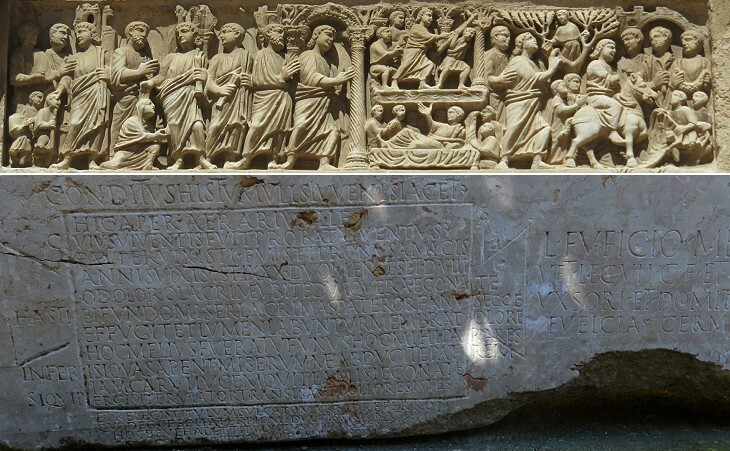 A detached section of the National Archaeological Museum of Tarragona houses a number of sarcophagi, gravestones and other materials which were found in the Necropolis or which illustrate the history of Early Christian Tarragona. The two sarcophagi shown above demonstrate the continuity in the design of sarcophagi between the Late Pagan and the Early Christian periods. 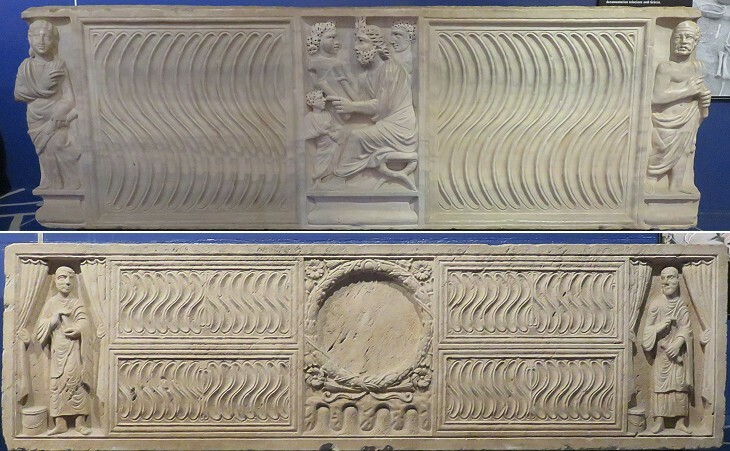 The main decorative pattern is based on the double curves of strigils; in the Pagan sarcophagus the couple of dead are portrayed at the corners of the long side of the box and are holding the tabulae nuptiales, the formal act of marriage, in the Christian one they are replaced by Sts. Peter and Paul who also hold a scroll (notice the curtains behind them which appear also in mosaics at S. Apollinare in Classe at Ravenna). In both sarcophagi the centre of the box is occupied by a relief. The Christian one shows a Wreath of Victory and the Four Rivers which flowed out of the Garden of Eden; perhaps the wreath surrounded an inscription and a Christogram (as at Merida). The wealthiest Christians of Tarragone (as well as those of other large cities of Roman Spain e.g. 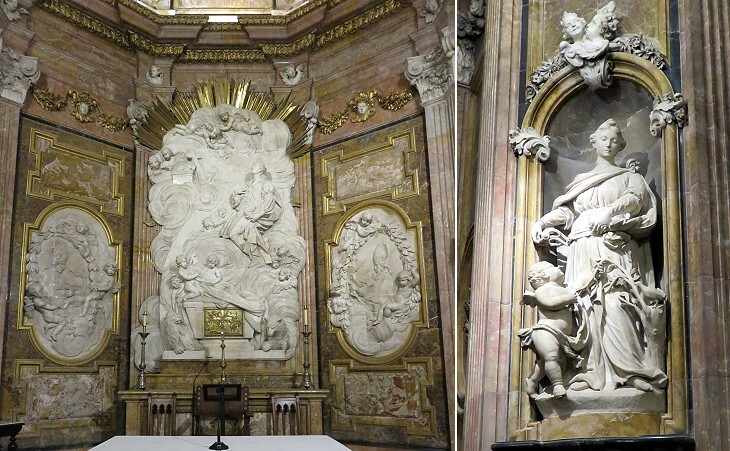 Cordoba) commissioned sarcophagi with reliefs depicting scenes from the New and the Old Testament. 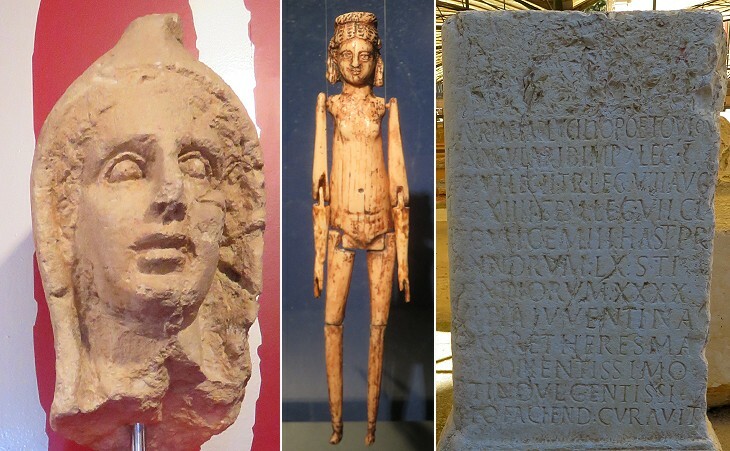 They were most likely made in Rome, where many similar sarcophagi have been found. 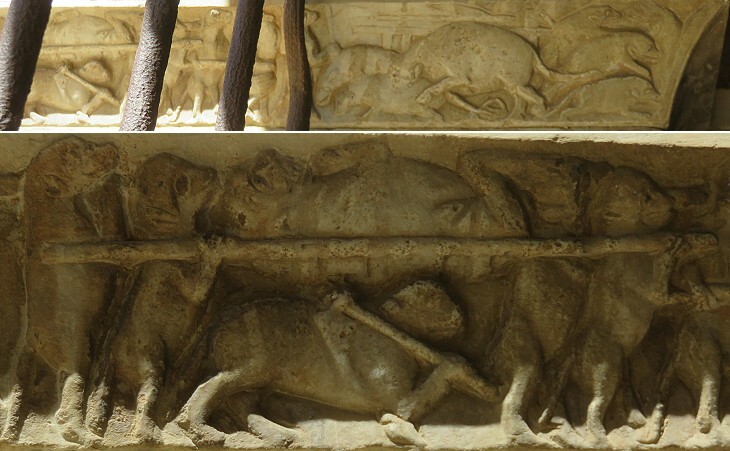 Not all the inhabitants of Tarragona could afford an expensive sarcophagus. The father of Aper utilized a gravestone with an epitaph to a Roman army veteran and his wife to add a poem in which he mourned the death of his son. Aper, the coppersmith, whose youth, while still alive, was praised. You lived as a poor man, you were attached to your friends. You lived 30 years, two months, and 8 days. Oh pain, oh tears, where do I seek you now, my son? Wretched, I, your father, abandoned, shed these tears for you - behold! My eyesight vanishes, my limbs succumb to my pain. It would have been more appropriate, had you prepared such burial for me! If the gods of the underworld have any reason, take me, the wretched father, away as well. I have already lost my livelihood, when I lost you, my son. Whether you continue your way, traveller, or you pass by or rest a little and read the inscription on the stone, carved with iron, which, I, the father had made for my sweetest, dutiful son, then the inscription will contrive that, in this mound, the bones will rest in peace. Farewell forever and in perpetuity, my sweetest son. The stone was reused in the Visigothic church in the amphitheatre. It is dated late IInd/early IIIrd century AD, a period of uncertainty in religious matters and Aper's father made only a generic (and negative) reference to the gods of the underworld. The use of mosaics to decorate tombs was not frequent in Spain, but it was so in Roman Africa with which Tarragona had trade links (see some tombs at the Museum of Bardo in Tunis). 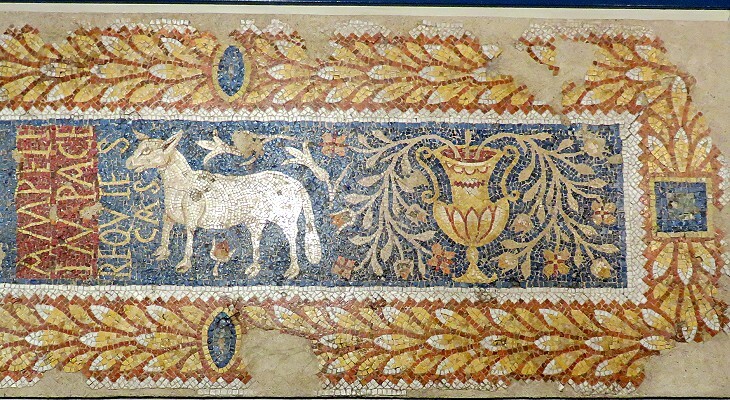 Similar to what can be noticed in sarcophagi, Christian symbols incorporated Pagan ones; in this mosaic the kantharos, a jar with a grapevine growing from it which was a symbol of Dionysus/Bacchus became a symbol of Eternal Life with flowers or apples replacing the grapevine, as at Sufetula. The mosaic is dated from the IVth to the VIth centuries. It depicts a man wearing a toga, the garment of Roman senators and magistrates which was no longer in use when the mosaic was made, but was a symbol of authority. Optimus, the name of the dead could be instead an adjective as it means "best" and it was used in Deo Optimo Maximo, the traditional Pagan dedication. 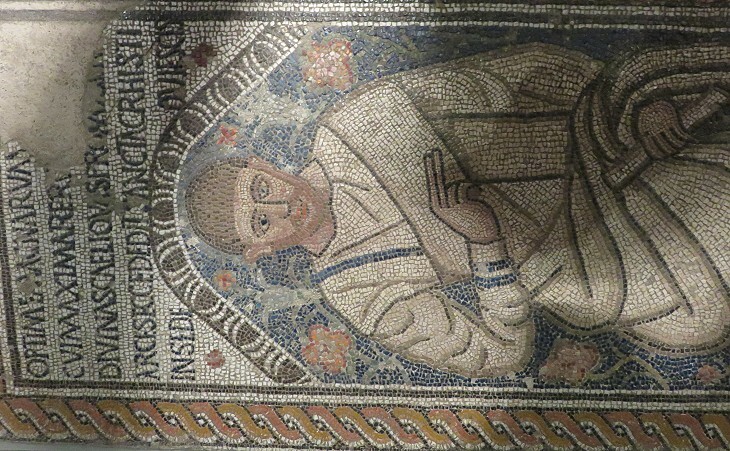 The man portrayed in the mosaic is often referred to as Bishop Optimus because of the position of his right hand fingers which are shown in the act of blessing (you can see it better in a mosaic at Cefalù in Sicily). The image used as background for this page shows a dove in another Christian funerary mosaic. The cathedral church is at present the only building which can fix attention. 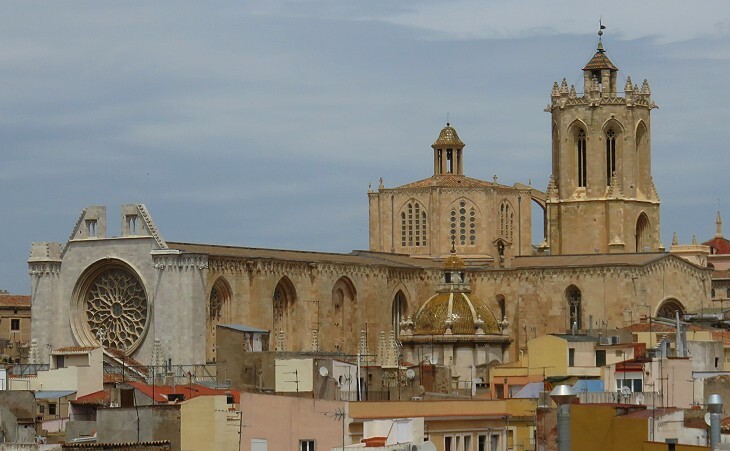 Tarragona lords it over its fertile campo, seated on a rock-built eminence, with tiers of wall and bastion rising one above another, while the cathedral seems the donjon-keep of the imposing outline. 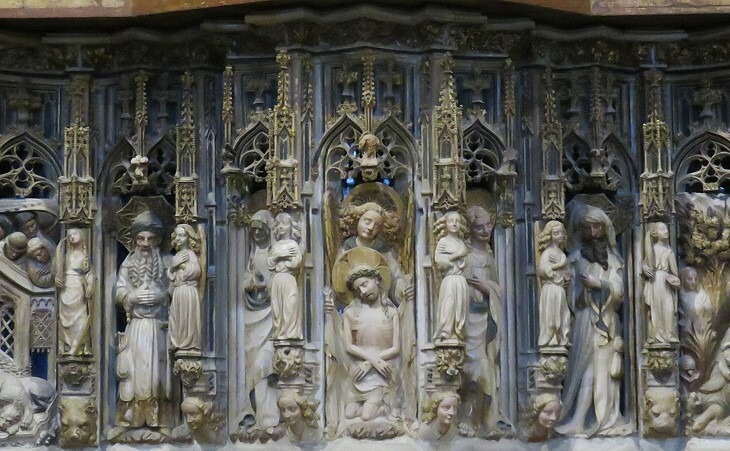 The Cathedral is outside the scope of this page, but it deserves a few words and images. Thecla (the name means God's Fame) is believed to have died at Seleucia ad Calicadnus (today's Silifke in southern Turkey), but Tarragona is not the only place claiming to be her hometown or the site of her martyrdom (see a page on Maaloula in Syria). Her life is very similar to that of Saint Agnes of Rome. The cathedral, dedicated to Saint Thecla, is ugly, but the new chapel of that tutelar saint is beautiful. The inside is faced with yellow and brown marbles, dug up in the very centre of the town, and ornamented with white foliages and bafs-reliefs. The architecture is accounted heavy, but I confess I did not think that fault very glaring. The whole together has a very pleasing effect. 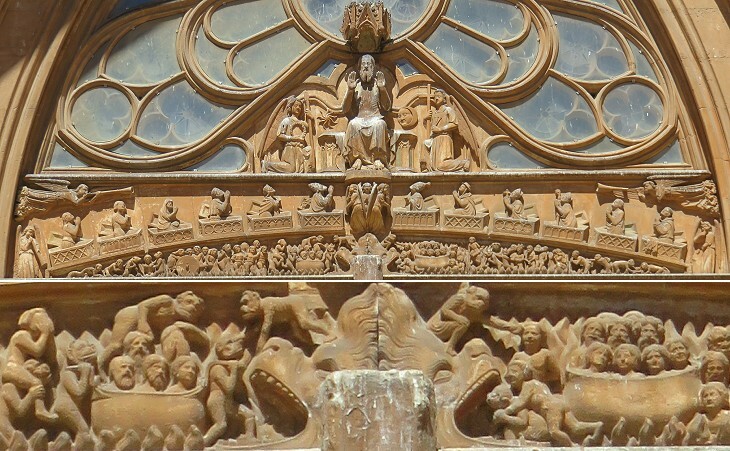 The design of the chapel and of its statues and high-reliefs was greatly influenced by Roman patterns. 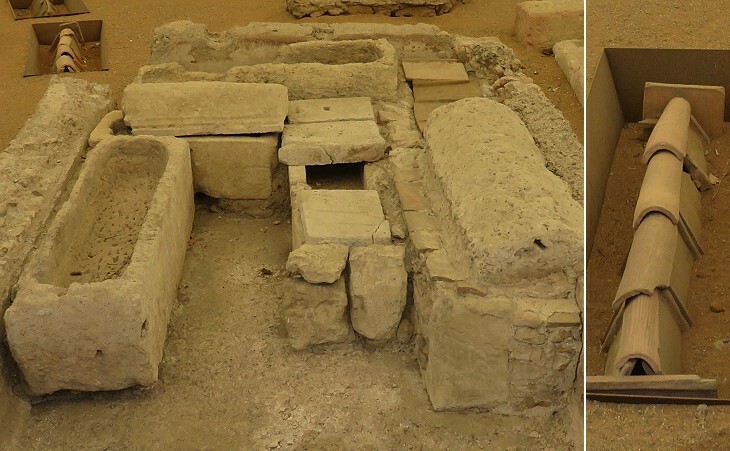 Some remains of a Temple to Augustus have been found under the cloister. 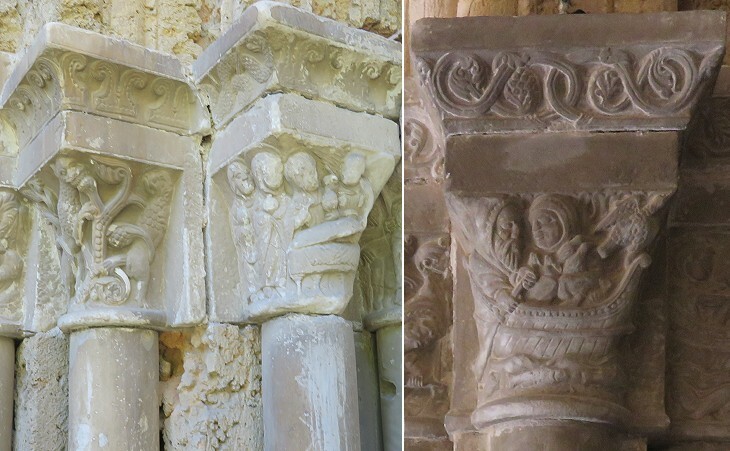 It is possible that a mosque existed on the site where the Romanesque cathedral was erected, but the only evidence of Islamic art at Tarragona comes from Medina Azahara, a countryside residence of the Caliphs of Cordoba. 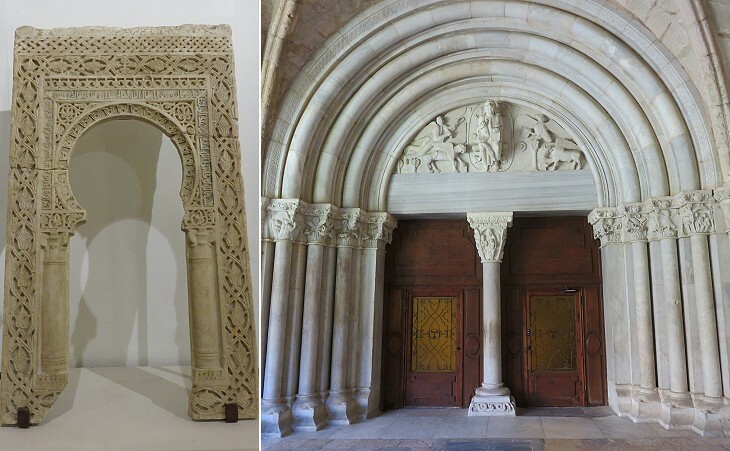 The site was pillaged when the Caliphate collapsed in the early XIth century and perhaps the mihrab decoration was brought to Tarragona by one of the warriors which took part in the pillage. 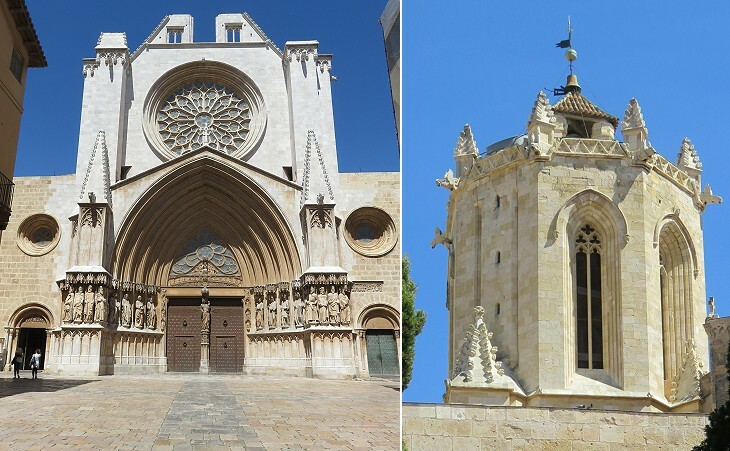 Move to Introduction and Walls and Fora, Main Monuments, Archaeological Museum or The Environs of Tarragona.